Certain streaming services will function more reliably if you block specific IP addresses on your router. This guide will show you how to block specific IP addresses on Netgear routers, using two Google DNS server addresses as an example (8.8.8.8 and 8.8.4.4). To block specific IP addresses on your Netgear router, you’ll need to set static route rules. These rules ensure your network traffic will not flow through the IPs you specified. 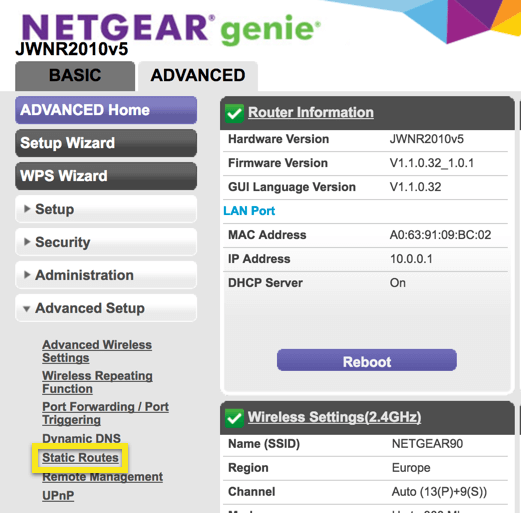 Note: These instructions were tested on a Netgear JWNR2010v5 router and may not apply for some other Netgear routers. With your router connected to the internet, go to 10.0.0.1 (or 10.0.0.2 or 10.0.0.0). If you’re stuck, see instructions for finding your router gateway. Sign in with your router username and password. The default username and password are usually admin and password. You can check this on some models by looking at the bottom of the router. At the top of the page, click the ADVANCED tab. On the left, under Advanced Setup, click Static Routes.